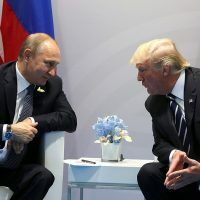 (Byron York – Washington Examiner) Was Russia’s effort to interfere in the 2016 election the most important issue on the table at President Trump’s Helsinki summit with President Vladimir Putin? No. But it’s not an unimportant issue either, and Trump knew the American press is obsessed with it. So he knew it would play a big role in the Trump-Putin post-summit news conference. There are all sorts of aspects to the Trump-Russia affair, but in light of special counsel Robert Mueller’s decision to indict 12 Russian intelligence agents on Friday before the Monday summit, the president also knew reporters would want to hear him specifically affirm Mueller’s allegation that the Russian agents hacked the Democratic Party and Hillary Clinton campaign.